Our downtown flower program is a labor of love from start to finish every single year. 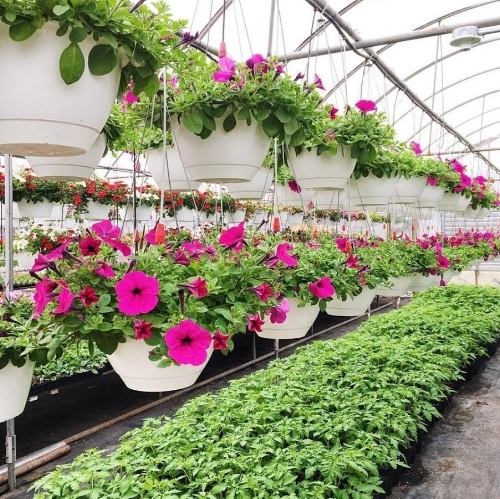 Seeds are planted by February and tended to by Jay Huck and his team at Huck Greenhouse in Devola until our volunteers are ready to hang all 280+ baskets the 2nd week of May. This year, our Design Committee added a brand new opportunity for our community to celebrate Mother's Day and downtown beautification at the same time. Community members are invited to sponsor downtown flower baskets In Honor of or In Memory of their mothers. Funds raised through this effort will go directly towards offsetting the ~$14,000 cost of planting and maintaining our flowers the whole summer through. Every year, Marietta Main Street raises money for this effort, primarily through grant funding. The success of this fundraising effort would allow our Design Committee the freedom of planning for new beautification efforts, like public art, entryway signage, pedestrian-level flowers and plants, updates to current green space, and more. We are opening the opportunity for 250 flower baskets to be sponsored by our community. The cost to sponsor a hanging flower basket is just $50, which includes the gift tag, inclusion in our list of sponsors, and a beautiful, cared for, and adored flower basket in downtown Marietta in the summer season with our most foot traffic as a community from both locals and tourists alike. The full list of sponsors and mothers will not be announced until after Wednesday, May 9th, and flower baskets will be removed in mid-September. Gift tags will remain through mid-June.